Over the last two decades, Emmanuel Karenzi Karake has cut a striking figure in the world of Rwandan intelligence, having navigated the corridors of power with intellectual prowess. His former colleagues describe him first and foremost as a master at exploiting weakness, a man able to target enemies with astounding precision and never missing his mark. He understood on a visceral level what Paul Kagame wanted to accomplish in the aftermath of the 1994 genocide and knew on a cerebral level how it should be done. “Quite simply, Karake is the most brilliant officer that Kagame has ever had,” said an ex-colleague now in exile. “He is observant and careful. Kagame trusted him most of the time…except when he suspected Karake might be building his own power base,” the officer explained. “At the planning and killing level, he is more shrewd than most. It is hard to escape his traps. Karenzi doesn’t miss a target,” the source explained. Raised by Tutsi refugee parents in the Congo, Karake was schooled in Uganda and underwent military training in Tanzania before becoming a civil intelligence officer at Ugandan President Yoweri Museveni’s office following the ouster of dictator Milton Obote in the 1980s. In the early 1990s, after Kagame’s Rwandan Patriotic Army (RPA) invaded Rwanda and unleashed a civil war, Karake became a member of an African Union military observer group before becoming a key liaison officer for the Rwandan Patriotic Front (RPF) in its dealings with the United Nations peacekeeping mission, UNAMIR. The experience put Karake in good stead when the RPF swooped into the capital, swore in a new government and promised to rebuild Rwanda from its ashes. Having a predilection for socializing and enjoying the company of women, Karake is the polar opposite of socially austere Kagame. Unlike his boss, he is actually popular with Tutsi officers and soldiers, even among the lowest rank. His only real nemesis, colleagues pointed out, was Kayumba Nyamwasa, his predecessor who headed the notorious Directorate of Military Intelligence (DMI) before and during the genocide. Just what was the role of DMI, an institution led by Karake for nearly three years after the genocide? Rwandans have variously described DMI as a repository of malevolence and pain. “The Directorate of Military Intelligence was created in late 1990 as part of the RPA military structure. From its creation and until the end of the war in 1994, Colonel Kayumba Nyamwasa was in charge of this directorate. The DMI is hated and feared by most of the Rwandan population, inside and outside of Rwanda due to its reputation for cruelty and killing operations. Most of the massacres attributed to the RPA were committed by the DMI,” the document states. From testimony collected from witnesses, investigators stipulated that “after the war, the Hutu population were arrested by DMI agents in given places and eliminated at a great rate. The bodies were incinerated and ashes were buried.” Sports grounds and military camps were often created over common graves. “Places where massacres executed by agents of the DMI sometimes with the assistance of soldiers were: Gabiro, Kami, Masaka, Giti, Nyamirambo, Kidaho, Butaro, Kirambo, Ruhengeri city, Kinihira, Nyungwe Forest, Kabutare, Butare Aboretum, Save, Gikomero, Ndera, Runda, Musambira City, Rambura, Muhura-Buyumba City,” investigators wrote. “It appears that the principal heads of the DMI are responsible not only because of their personal actions but also because of the orders given. They are also accountable on the basis of the responsibility of the superior hierarchy,” the investigators concluded. He said one day in August 1994, at about 5:30 pm, he was heading to Kami just as a soldier was leaving. The soldier said he was exhausted after killing Hutus for eleven hours straight. “There are still many and Afandi KK (Karenzi Karake) wants the job to be completed before tomorrow,” the soldier told him. The Tutsi officer arrived on site and found hundreds of Hutu men “screaming and agonizing,” their arms tied behind them and legs bound. “It was horrible,” he recounted, adding that soldiers were looking for hoes to bury them alive. He said Karake visited the camp that night, was pleased with the scene and quickly retreated to DMI headquarters, which was called Ku Kabindi (the Calabash) because it was next to a building with a calabash and straw. Karake’s Achilles Heel, shared by many upper echelon members of the RPF, was his antipathy toward Hutus. “He hated Hutus. He would kill a person just because he or she was Hutu,” the officer said. And yet many years ago, Karake fell in love with a Hutu girl who was very beautiful. But for a senior ranking Tutsi officer it was unheard of—and even dangerous—to contemplate marrying a Hutu woman. 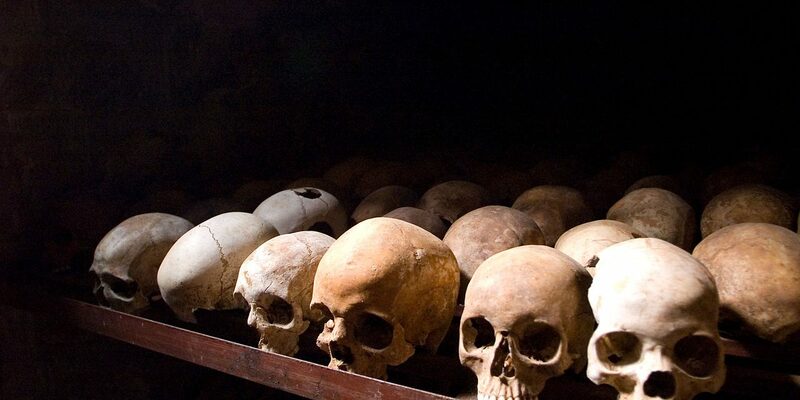 The RPF’s Hutu extermination policy reached its apotheosis under Karake’s tenure, when DMI supervised with great precision the 1996 invasion of Zaire and the mass killings of Congolese and Rwandan Hutu refugees. The killing squads in Zaire, now the Democratic Republic of Congo, were supervised by DMI and instructed by Karake, according to an officer involved in operations. “No intelligence officer could operate without orders from KK. All intelligence officers from all units and sub-units were provided by DMI and could be replaced by DMI,” he said, adding that DMI worked closely with the gendarmerie, military police and external intelligence. In an interview, a former soldier from a mobile DMI unit recounted killing Hutus in the Congo in November 1996. “We stopped in Kasindi (in Zaire) and conducted ‘clean up’ operations throughout the area. We got rid of everyone considered an enemy: that meant all Hutus. We found the refugees in the forest. There were starving and sick. There was no water or food for these people. But we were told to eliminate them. So we killed them all. We even killed those who were dying, with perhaps only a few minutes to live. We didn’t use guns on the weakest. We used traditional weapons like agafuni (hoes) to finish them off. “Most of the killings of refugees took place in the jungle. But if refugees tried to hide in towns, we went after them and identified them. By the time Rwandan troops reached Bafwasende near Kisangani in January 1997, many refugees, more than ten thousand, were killed, the soldier said. “I was part of a team that unearthed corpses from mass graves. We worked day and night for a long time to take bodies to other locations to be incinerated. It was about the time when people were calling for an investigation to confirm whether indeed there had been massacres of Hutu refugees in the area. Rwanda of course was denying the allegations and we had to destroy the evidence. We needed to hide the proof. In 2010, an investigation by the UN Office of the High Commissioner for Human Rights concluded that Rwandan troops committed crimes against humanity and possibly genocide in the former Zaire. The author of that report, a war crimes prosecutor from Montreal named Luc Coté, said that Rwandan Tutsi troops and their rebel allies targeted, chased, hacked, shot and burned Hutus—men, women and children—in the DRC. Coté previously worked in the ICTR’s Office of Prosecutor and was responsible for indicting Colonel Theoneste Bagosora, considered the architect of the 1994 genocide against Tutsis. In the first disordered weeks of the Rwandan invasion of Zaire, several hundred thousand Rwandan refugees headed eastward back home, while another mass of humanity fled deeper west into the jungle, chased by RPA forces. Mainstream media, channeling officials in Kigali, declared the forced return of Hutus as a victory against genocidal forces that had used the camps in Zaire as rear bases to mount attacks against Rwanda. What journalists did not say was that thousands of Hutu men were systematically separated from their families after crossing the border in late 1996, only to be transported in trucks and killed in Nyungwe Forest, Akagera Park, Camp Kami and other execution sites, according to dozens of Tutsi officers familiar with operations and families of Hutu men who disappeared. The coordinated killings of Hutu refugees inside Zaire and the elimination of Hutu men that returned home also coincided with a brutal counterinsurgency campaign the RPA had begun to wage in areas along the western border, particularly in Ruhengeri and Gisenyi. The RPA was accused of going house-to-house, slaughtering civilians, burning huts, and of targeting local critics who dared to raise their voices. It was during that time that Kagame and Karake made a strategic error of epic proportions, their critics say. They decided to target witnesses—several of them foreign nationals working for NGOs—who knew what was going on in the area. On January 18, 1997, three Spanish nationals working for Doctors of the World were murdered in Ruhengeri. The Spanish court holds Karake responsible for the massacre. An individual who worked with Karake said he indeed organized and monitored the killings of the Spanish humanitarian workers and the murder of Guy Pinard, an outspoken Québecois priest who openly condemned RPA atrocities against civilians during his sermons. According to a source with knowledge of the operations against the Spanish and the priest, which occurred within two weeks of each other, the killings were organized by DMI in conjunction with the Gendarmerie. The DMI departments involved were Counter Intelligence led by Charles Karamba and the Criminal Investigation & Prosecution, led by Joseph Nzabamwita. Father Guy Pinard was shot in the back on February 2, 1997 in front of parishioners while giving communion. His attacker, a Tutsi with connections to the RPF, fled the scene and was never charged. Unlike Spain, Canada did not investigate or seek justice. ICTR investigators collected testimony indicating that RPA troops had temporarily occupied the Catholic Church in Ruhengeri, Father Pinard was in charge of the church when 20 bodies were found in a latrine pit on the premises, after the RPA vacated the site. Pinard was killed shortly thereafter. The priest who was in charge of exhuming the bodies was also murdered, according to the ICTR document. Absent from the Spanish indictment is the role that DMI, under Karake, played in the murder of another Canadian priest, Claude Simard on October 17, 1994. Simard, who was beaten to death with a hammer in his home in Butare, had been gathering evidence of RPA killings in the form of audio recordings that he planned to hand over to the international community. A UN civilian police report concluded that the army had learned of Father Simard’s plans to give the recordings to the United Nations. Karake is currently director general of Rwanda’s National Intelligence and Security Services (NISS), an umbrella spy agency that oversees intelligence gathering in civilian and military spheres. Karake’s formidable and horrifically violent reign as military intelligence chief after the genocide, and his role in murdering three Spanish nationals led to his arrest on June 20 in London under a European Arrest Warrant issued by the Spanish government. He faces an extradition hearing in October. In 2008, Judge Fernando Andreu Merelles indicted Karake and 39 other RPA commanders on charges of genocide, crimes against humanity, and other offenses that include terrorism in a case of universal jurisdiction. Since then, the Spanish court has collected additional evidence against Karake and other RPF officers, a Spanish lawyer handling the case confirmed. If the 1994 genocide against Tutsis stands as the most depraved and tragic chapter in Rwanda’s history, its corollary is certainly the three years that followed in which a slower, largely hidden campaign of abject cruelty was meted out against Hutu civilians in Rwanda and the DRC, with barely a whimper of international outcry. If extradited to Spain, Emannuel Karenzi Karake could become the jewel in the crown of witnesses against Kagame’s two-and-a-half decades of crime. He was, by all indications, the most successful of Kagame’s willing executioners. And yet Karake’s friends insist his culpability is complex. “Yes he was at the center of killing operations in Rwanda for years. But he’s been humiliated too, and was aware that things were not going well,” said one friend. “Many bad decisions were taken. But what Kagame wants, Kagame gets,” the friend said.